The 600 Voyageur® 144 is for riders that want an agile, all-purpose sport-utility snowmobile. 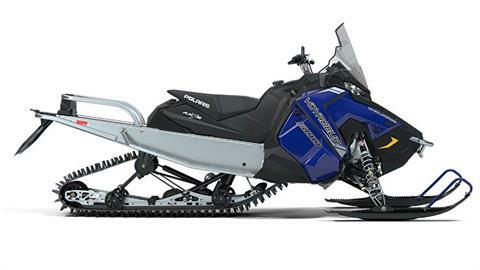 This sled's Rider-Balanced™ AXYS® Chassis and IGX 144 Rear Suspension provide superb handling off-trail and on-trail. AXYS® CHASSIS: The AXYS chassis for the 144 platform is light and strong, offering rider balanced characteristics critical for the 50 / 50 rider. The rider is moved into a balanced position on the sled so it rides flat through the corners. When the trail gets rough or the rider jumps off into the powder, rider balance enables the rider to move back and make the front end light to climb up on top of the snow or the moguls. IGX 144 REAR SUSPENSION: A core element to the AXYS 144 platform is the Ideal Geometry X-Over 144 uncoupled rear suspension, which offers the ultimate blend of durability and strength. The IGX 144 rear suspension provides RMK-inspired off-trail agility and balance with a drastically improved on-trail ride. Pitch is controlled through geometry in this rear suspension. With 43% more front torque arm travel, this sled features reduced bottoming and less drag off-trail. An optimized, lighter, tipped rail beam design gives the sled a nimble feel. POWDERTRAC HYBRID RUNNING BOARDS: The PowderTrac Hybrid running boards offer optimized design with 56% open space for maximum snow clean out while maintaining extreme strength. Designed specifically for the crossover rider, the boards are wider and flatter in the front for comfort while sitting and better positioning while standing up. The rear of the boards tapers back for better mobility and snow clearance when carving. 600 CLEANFIRE ENGINE:The 600 Cleanfire engine is part of the Polaris family of Liberty engines built in the USA. This engine is a 600 cc, liquid-cooled, SDI engine that provides proven reliable performance, instant acceleration, easy starting and great response. POLARIS MESSAGECENTER GAUGE: The Polaris MessageCenter Gauge features: 1. Larger viewable LCD screen @ 4.3 in. 2. Increased display area +25%. 3. Scrolling message center. ELECTRIC START: Standard electric start ensures easy starting so you can ride after the simple turn of a key. LED LIGHTS: All models built on the AXYS platform feature standard LED headlights. LED headlights deliver the industry’s best lighting: 1. Nearly 1 lb. lighter and high beams are 80% brighter than incandescent lighting. 2. Color temperature or output of the lights (the “whiteness” of light, reported in Kelvin) is 5000K, closely matching daylight. 3. LED headlights last the entire lifetime of the sled. A major durability enhancement over traditional incandescent headlights which experience filament burn out. 4. For constant visibility and enhanced safety, the low beams remain on at all times. Even when the high beam is activated, there is never a period of no light. 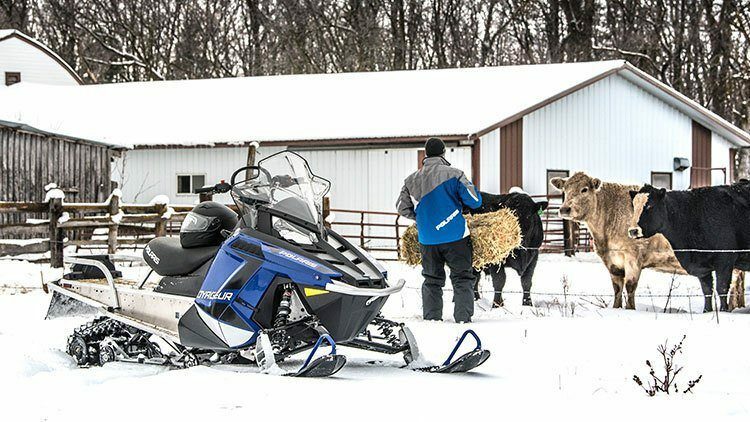 INTEGRATED STORAGE & CARGO RACK: Standard underseat storage was designed and developed right along with the AXYS platform, so it installs securely and features seamless, integrated styling that matches the sled’s design lines. 1. Compression-molded materials provide semi-rigid storage and enhanced styling. 2. Sturdier zippers provide better cargo security and protection. 3. Installs without tools. 4. Standard rear rack offers additional cargo capacity, up to 25 lb. 2.0 SERIES 4 TRACK: Stiff lug base for hard-pack performance, soft and flexible tips for superior deep snow traction. RydeFX MPV SHOCKS: RydeFX shocks provide a great foundation for ride and handling. HITCH: Hinged tow hitch for greater versatility and better towing.